Langerhans cell (LC) sarcoma (LCS) is a high-grade neoplasm with overtly malignant cytologic features and an LC phenotype. We very recently suggested that LC behaves as a reservoir for common dermotropic Merkel cell polyomavirus (MCPyV) and determined the relationship between LC histiocytosis (LCH), which has an underlining oncogenic capacity, and MCPyV as a trigger for a reactive process rather than a neoplastic process. We propose LC to be a reservoir for MCPyV and hypothesize that some LCS subtypes may be related to the MCPyV agent. We examined seven LCS tissues using multiplex quantitative PCR (Q-PCR) and immunohistochemistry with anti MCPyV large-T (LT) antigen antibody. High viral loads of MCPyV DNA sequences (viral load = relative levels of MCPyV) were detected (0.328–0.772 copies/cell (Merkel cell carcinoma (MCC) = 1.0)) using Q-PCR in 43% (3/7) tissues, but LT antigen expression was not observed (0/7). Frequent MCPyV-DNA amplification suggests that LCS in some patients may be related to MCPyV infection. Moreover, the higher viral load of LCS (median, 0.453 copies/cell) than low load of LCH (0.003, median of 12 cases) (P < 0.01) may suggest a virally induced tumorigenic process in some LCS. Although the absence of LT antigen expression may indicate a different role for MCPyV in this pathology, some subtypes of LCS may develop in the background of MCPyV-infected LC. To the best of our knowledge, this is the first report on the relationship between MCPyV and LCS. The recent discovery of MCPyV opened new therapeutic avenues for MCC. These data open novel possibilities for therapeutic interventions against LCS. Merkel cell polyomavirus (MCPyV) was discovered in 2008 and was linked to the pathogenesis of Merkel cell carcinoma (MCC), which is a rare and aggressive skin cancer occurring in the dermis of individuals aged 60 years or older [1, 2]. Approximately 80% MCC harbors MCPyV, indicating its prominent role in the development of the disease. Mechanistically, MCPyV-induced oncogenesis is considered to be induced by MCPyV large T (LT) antigen through molecular binding with the retinoblastoma protein . Several tumorigenic processes leading to MCC were proposed. One was that the induced mutations of MCPyV due to long exposure to ultraviolet light leads to integration of the cytoplasmic viral sequences into the DNA of originating MCC cells. MCPyV primarily resides on the skin, and we have detected MCPyV-DNA in the organs of autopsy cases, with the highest prevalence (53%) in the skin . Because Langerhans cells (LCs) exist above the middle of the spinous zone of epidermis  and can capture external pathogens  and because of their ability to play roles as antigen-presenting cells [6, 7], we proposed that external pathogens may be initially recognized by LC and may subsequently infect Merkel cells which are mostly located at the basal cell layer of the epidermis. Therefore, we hypothesized that LC were a reservoir for MCPyV and demonstrated this phenomenon by showing MCPyV-DNA in microdissected LC of dermatopathic lymphadenopathy (DLA) . In this study, we hypothesized that LC sarcoma (LCS) may originate from a long standing reservoir cell for MCPyV and showed some prevalence of MCPyV-DNA in LCS with high viral load compared with that in non-affected LC. The results of Q-PCR tissue analysis for MCPyV are shown in Table 1 with a positive (MCC = 1.0) and negative control (water = −). MCPyV-DNA sequences in three of seven tissues from LCS patients were detected corresponding to high viral loads (0.328–0.772). The median age of the LCS patients (n = 7) was 72 years (range, 42–81 years of age). *Positive control (MCC):+ (Viral load = 1.0), Negative control (double distilled water): −. Viral load, relative levels of MCPyV. Abbreviations: LCS Langerhans cell sarcoma, LN lymph node, MCC Merkel cell carcinoma, MCPyV Merkel cell polyomavirus, Q-PCR multiplex quantitative PCR for MCPyV. Neither cytoplasmic nor nuclear immuno-reactivity for this protein was observed in LCS cells as reported in Figure 1 and Table 1. MCC as a positive control is shown in Figure 1. No immunoreactivity for MCPyV-LT using CM2B4 antibody in LCS tissue lesion (LCS4). Insert: MCC tissue lesion as a positive control. Scale bar, 50 μm. Abbreviations: CM2B4, a monoclonal antibody to MCPyV-LT; LCS, Langerhans cell sarcoma; MCC, Merkel cell carcinoma; MCPyV, Merkel cell polyomavirus; MCPyV-LT, large T antigen protein of MCPyV. LC is an epidermal dendritic cell (DC) with antigen-presenting cell capacities. Immature DC typically responds to pathogen exposure by specific maturation processes that facilitate induction of further innate and adaptive immune responses [6, 9]. However, some viruses, such as HIV, vaccinia, measles, and dengue, interfere with DC function and maturation to escape the immune surveillance [9–13]. Buffy coats of healthy donors above 20 years of age examined for MCPyV-DNA showed a 22% prevalence . In this study  the cellular reservoir was not shown. In another investigation , CD14+ activated monocytes in peripheral blood were shown to serve as a reservoir for MCPyV. Recently we have described the prevalence of MCPyV in human tissues from 41 autopsy cases, i.e., skin (53%), lymph node (0%, excluding DLA), and lung (8%), with low viral load (viral load = 0.00026–0.22) . Our data indicated the possibility that MCPyV is a dermotropic virus. We have previously shown the prevalence of MCPyV in LC in DLA tissues (viral load = 0.001–0.006) and in LC histiocytosis (LCH) lesions (viral load = 0.0001–0.033) . Our data using DLA tissue, in which epidermal LCs with MCPyV migrate into lymph nodes [16, 17], suggest that LC is a candidate reservoir of MCPyV in the epidermis. MCPyV may also interfere with LC functions similar to some viruses, as mentioned above. In this study, we have shown the presence of MCPyV in LCS with high viral loads (Table 1, viral load = 0.328–0.772). MCPyV-positive LCS samples were compared with MCPyV-positive LCH samples  in the point of MCPyV viral load in Figure 2 with significant difference (P < 0.01). The presence of MCPyV in LCS lesions suggests three possibilities: a) viral infection as a consequence of LCS development, b) LCS as a bystander, and c) a viral causal agent of LCS. Though MCPyV is typically an asymptomatic infection in adults , the presence of MCPyV with high viral loads denies the possibility it is a simple bystander within LCS lesions. Q-PCR data comparing MCPyV-positive LCH samples and MCPyV-positive LCS samples. Q-PCR provides the viral load of MCPyV (relative level of MCPyV (MCC = 1)) for MCPyV-positive LCH samples and MCPyV-positive LCS samples plotted as box-whisker plots (Mann–Whitney U test, P < 0.01). The median viral load data are 0.003 and 0.453 in MCPyV-positive LCH and MCPyV-positive LCS, respectively. Abbreviations: LCH, Langerhans cell histiocytosis; LCS, Langerhans cell sarcoma; MCC, Merkel cell carcinoma; MCPyV, Merkel cell polyomavirus; Q-PCR, multiplex quantitative PCR. Whether MCPyV-DNA is integrated into the nuclei of LCS cells as an oncogenic virus warrants further investigations, but the high viral loads of MCPyV in LCS lesions may suggest an important oncogenic factor in LCS cells. We are now trying specific PCR as Sastre-Garau et al. did . Immunohistochemical negativity for MCPyV-LT (CM2B4) may indicate a different tumorigenetic mechanism that is involved in MCPyV-LT positive MCC [1, 20] or under the limit of detection for MCPyV-LT.
To the best of our knowledge, this is the first report indicating a relationship between MCPyV infection and LCS. Thus, we suggest that MCPyV may play some role as an oncogenic factor in particular subtypes of LCS. Based on the foregoing, we propose an LCS tumorigenesis model that MCPyV may be a cause of LCS. The recent discovery of MCPyV opened new therapeutic avenues for MCC . Although MCPyV-LT expression was not detected, the origin of some forms of LCS may be MCPyV-infected LC. When confirmed, these findings will open novel possibilities for therapeutic interventions against LCS. This study was approved by the Institutional Review Board of Faculty of Medicine, Tottori University, Yonago, Japan. A total of seven tissues from patients with LCS were analyzed. All tissues of LCS were obtained as formalin-fixed paraffin-embedded (FFPE) samples. Diagnostic accuracy of all collected samples, histological sections and immunohistochemistry for CD1a, S100 protein (S100), and CD207 (langerin) of all specimens was confirmed by two pathologists on the basis of the diagnostic criteria . DNA was extracted from each FFPE sample using the QIAamp DNA FFPE Tissue Kit and Mini Kit (QIAGEN GmbH, Hilden, Germany). Q-PCR was performed in a 10-μl reaction mix containing TaqMan® Copy number reference assay RNase P (Applied Biosystems, Foster City, CA, USA) as internal control . A primer pair targeting the position 859–934 (MCPyV-LT) on MCC350 (GenBank EU375803) was  used. To determine the MCPyV-DNA ratio relative to MCPyV-DNA of the reference MCC (MCC = 1.0) for each case, Q-PCR was performed using an ABI PRISM 7900HT Sequence Detection System (Applied Biosystems) as previously described . The ratio of the virus was determined using the viral signal in a positive MCC sample as a reference (viral load = relative levels of MCPyV, MCC = 1.0 copy/cell). Thresholds were plotted against each standard sample. All reactions of samples and controls were performed in triplicate, and the average was reported. The MCPyV-DNA ratio in each sample was determined on the basis of corresponding standard curves. 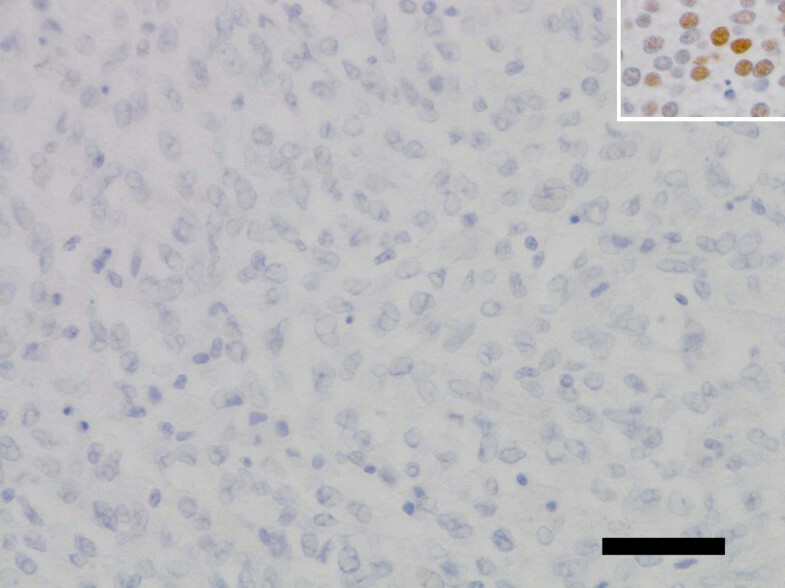 For detection of MCPyV-LT expression, immunohistochemistry was performed using monoclonal antibody CM2B4 (mouse monoclonal IgG2b, 200 μg/ml, sc-136172, Santa Cruz Biotechnology, CA, USA) generated against a peptide fragment of MCPyV-LT as immunogen [23, 24].MCC samples were used as controls throughout. Comparisons of MCPyV viral load between MCPyV-positive LCH and MCPyV-positive LCS were performed using the Mann–Whitney U test. Differences between values were considered statistically significant at P < 0.05. This work was partly supported by a Grant-in-aid for Scientific Research (C) 23590426 from the Japanese Ministry of Education, Science, Sports and Culture. We thank Dr. Toshiharu Maeda (Ehime Prefectural Central Hospital) for providing clinical information and specimens. IM, KH, and HN conceived the initial study proposal. IM, KH, and JG were responsible for writing the manuscript. All authors were involved in the design of the research. MM, TI, and SK were involved in the analysis of the data. All authors have critically reviewed and approved the manuscript.